MIO Horizontal Lifeline Fall Protection System (HLFPS) is designed for personnel working on rooftops. When a worker is attached to the HLFPS he will be able to traverse on the roof safely and freely. 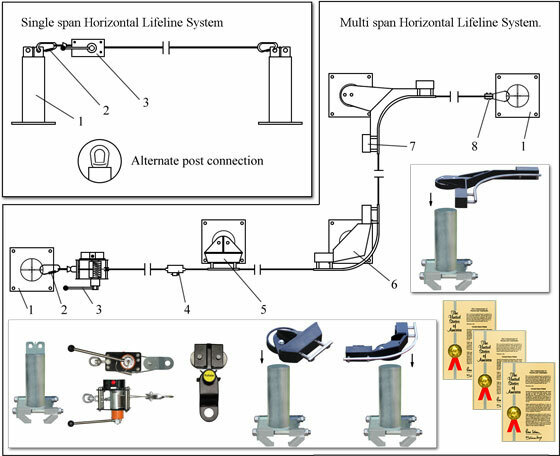 If the distance (span) between anchor posts does not exceed 60ft, only two End Posts are needed for the horizontal lifeline incorporated with a shock absorber (cable Unitensioner). When the distance between anchor posts exceeds 60ft then intermediate supports are required. Some configuration of the roof requires inside and outside corner anchor supports. See detailed information below.